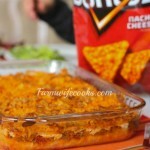 Perfect recipe to change up Taco Tuesday, Taco Bake is a great family friendly recipe that is husband and kid approved! This recipe is by far the most popular post on my other blog Two Maids a Milking. It was originally a post from my sister-in-law so I decided to remake and photograph it for all of you! 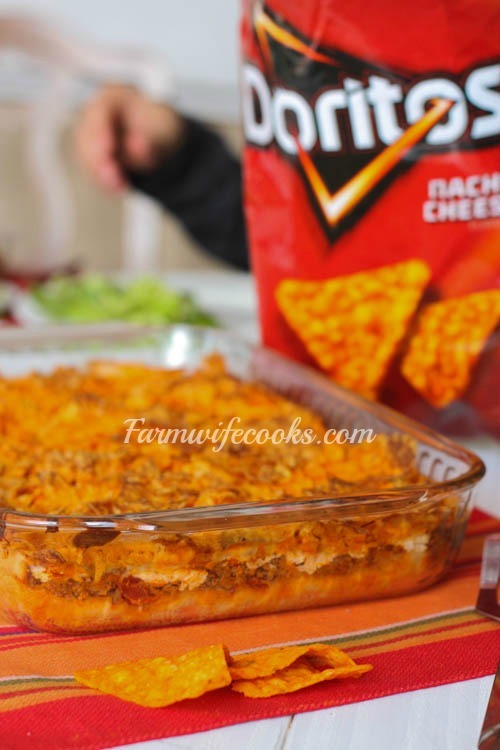 This recipe is perfect because it can be customized based on your families preferences. 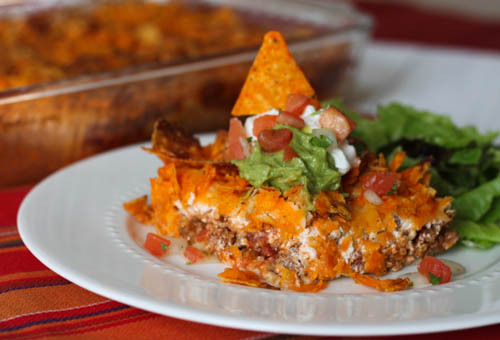 Ground turkey can be substituted for the ground beef, you can use low fat sour cream and cheese to lighten it up and can decrease the amount of chips for the top or use tortilla chips instead. You can also add salsa or substitute the can of tomatoes for a can of diced tomatoes and green chilies (Rotel) to kick up the amount of spice and easily add a layer or refried beans or black beans. and some people have had luck baking the crescent rolls for a couple minutes before adding the other ingredients. Some of the others who commented on the other post also waited to add the Doritos until the last 10 minutes of baking. No matter how you make this it is sure to be a crowd favorite! Click the video below to see step by step instructions. 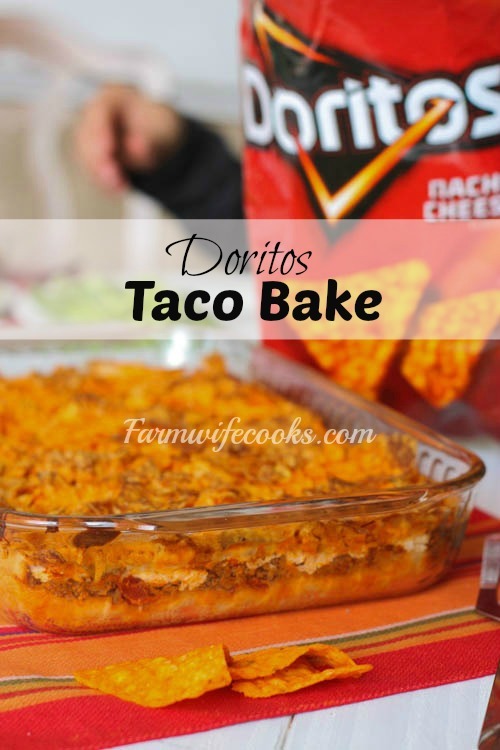 A great family friendly Taco Bake recipe. 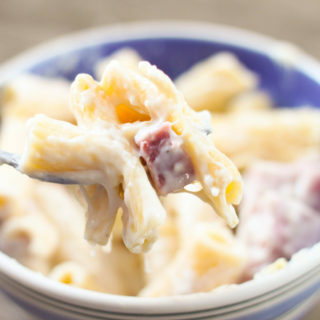 Easy weeknight dinner. Cook hamburger in medium skillet over medium heat until cooked through, drain. Add taco seasoning, tomato sauce, water, and diced tomatoes and simmer for 5 minutes. In a Glass, greased 9 x 13 inch pan press out crescent rolls and flatten to form a crust. Layer hamburger mixture, sour cream and then cheese. Crush Doritos and put them on top. Hi, this looks delish! what are crescent rolls? Crescent rolls, are a pre-made store bought dough that you make a roll into the shape of a crescent. For this recipe you use it like a crust and don’t actually make it into a roll. How fun! This is awesome for football season! 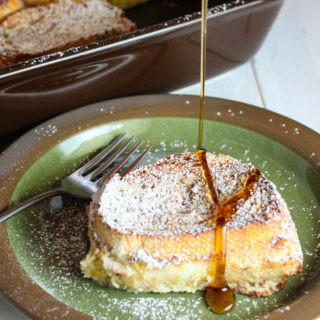 What is the carbs and sugars on this recipe? It will depend on the specific brand/ingredients you use so I would recommend figuring it yourself based on your preferences. I am not an expert in that area so I would hate to try and not be correct. I would assume their are resources online that would figure this based on your ingredients but I don’t know of any of the top of my head. Can this be done in a metal 9×13 pan? That’s all I have?! yes, but I would cook the crust a little before you put the toppings on otherwise it might get soggy. If I add salsa do I still use tomatoe sauce and tomatoes? I would still add the tomato sauce. This was SO easy and delicious. I used about 24 ounces of tomato puree instead of the sauce & diced tomatoes. Next time I’m going to make it even easier by using flour tortillas instead of the crescent rolls. Great Idea! I’m gonna try it tomorrow night on my hubby and kids. We definitely get into a rut of the same foods each week, and this is a nice change on something the teenagers make constantly. Even if it is just a texture change, it’s still a step in the right direction! since we already do the crescent roll sloppy joes, this will be just a tad different! 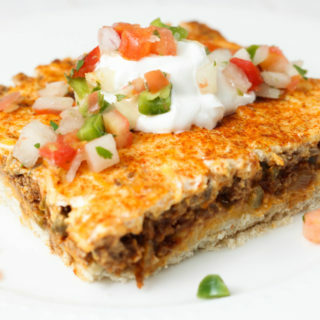 Would you put sauce under the tortillas, like in an enchilada lasagna? This looks like a dinner my whole family would love. Great dish for a family dinner!! The kiddos will love this! I’ll bet the Doritos make it irresistible! 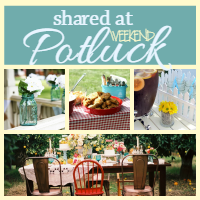 This would be such a fun bake for a tailgate party! My family would love it if I served this to them! YUM! This would be perfect for game day! SO glad you guys liked it! Just wondering has anyone tried putting a layer of refried beans down then the meat mixture and ext. I was wondering how that would turn out. Made this recipe tonight and is was a hit! About how long to prep. and about how many does it serve. About 15 mins to prep and serves 5-6 as a meal. Enjoy!